This dataset is one of the three separate files that the ICD-10-CM MAP contains. Extended Map contains the core publication of MAP data. There are one or more map records for each source concept mapped, including the ICD-10-CM target codes. 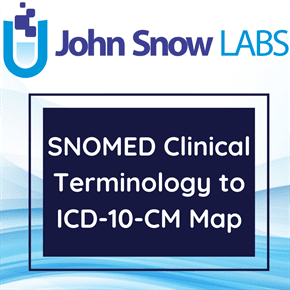 This dataset is an update of the SNOMED CT to ICD-10-CM Cross Map. The purpose of this update is to synchronize with the latest release of the US Edition of SNOMED CT by removing obsolete content. The mapping in this dataset is identified by the refsetid 6011000124106. Extended Map contains the core publication of MAP data. There are one or more map records for each source concept mapped, including the ICD-10-CM target codes. SNOMED CT is an extensive clinical terminology that was formed by the merger, expansion, and restructuring of SNOMED RT (Reference Terminology) and the United Kingdom National Health Service (NHS) Clinical Terms (also known as the Read Codes). It is the most comprehensive clinical vocabulary available in English (or any language). SNOMED CT is concept-oriented and has an advanced structure that meets most accepted criteria for a well-formed, machine-readable terminology. It has been designated as a US standard for electronic health information exchange in Interoperability Specifications produced by the Healthcare Information Technology Standards Panel and has also been adopted for use by the US Federal Government, through the Consolidated Health Informatics (CHI) Initiative, for several clinical domains. This cross map is a directed set of relationships from SNOMED CT source concepts to ICD-10-CM target classification codes. The SNOMED CT source domains for this mapping are limited to subtypes of 404684003 |clinical findings|, 272379006 |event| and 243796009 |situation with explicit context|.